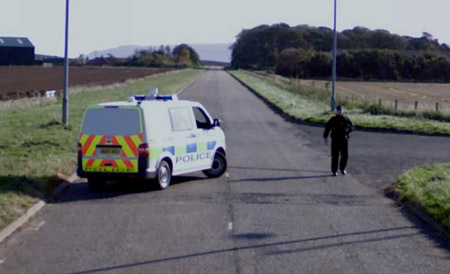 This is the awkward moment a Google Street View car came face-to-face with an armed policeman after stumbling onto – a high-security nuclear compound. The Google driver captured the moment the cop – dressed in black – approached the vehicle brandishing a high-powered rifle. A police van appears to have flagged the camera car down and is also captured on camera. Another cop, also dressed in black, is seen in the distance guarding the heavy metal gates of the compound. The remarkable images were captured at a loading depot near Dunbar, East Lothian, Scotland. 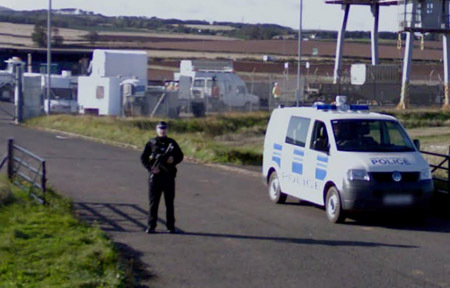 Behind the heavily-fortified gates, a train is visible which is believed to have been transporting nuclear rods to the nearby Torness nuclear power station. Internet enthusiast Alan Turnbull, 56, who runs the website secret-bases.co.uk, spotted the image while researching Scotland on the internet. Alan, from Stockport, Cheshire, said: ”I was just having a browse on Google maps when I came across this fascinating picture. ”It is such a coincidence that the Google street car came along to take pictures at exactly the same time as the nuclear shipment. It is quite funny really. ”The police and guards must have had kittens when they spotted the car with a big camera mounted on its roof. ”I daresay the poor driver had a bit of explaining to do as well – talk about being in the wrong place at the wrong time. ”There would have been a lot more guards there, these rods power the entire station and are extremely dangerous. ”I believe this particular officer was from the Civil Nuclear Constabulary, which is a special unit that protects nuclear sites throughout the country. Three weeks ago Torness nuclear power station was forced to shut down after high volumes of jellyfish were sucked up through the cooling filter system.